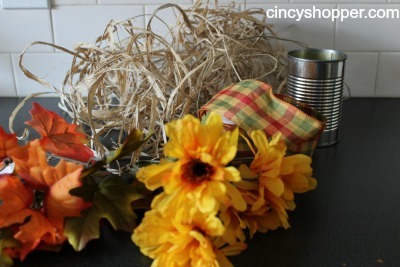 Time to quickly throw together a DIY Dollar Store Fall Raffia Vase. Having fall decor placed around my home at this time of year is quite important to me. I feel as though it creates a warm and inviting atmosphere. Year after year I seem to place the same decor on my shelves, tables, mantle, etc. Each year I think that just maybe next year I will be able to afford some new decor. Then when the next year comes I see all the really great fall items at Target, Pottery Barn, Grandin Road, etc and the prices really throw me back to the good old “maybe next year”. This year after looking over all the new fall decor at the stores I decide it was time to head back to the Dollar store and create some unique and inexpensive fall decor items for my home. We have many shelves and stands placed throughout our home that are needing some additional fall foliage. In an effort to keep all of this decor on the cheap I decided to re-purpose a soup can. I was rummaging through my Dollar Tree bags and thought a DIY Dollar Store Fall Raffia Vase would be a great addition to our family shoe cabinet. Take a look below at how quick and easy this Craft really is. 2.Place a small amount of adhesive. I used a glue gun but you can use any kind of adhesive you have on hand. 3.Glue one end of a strip of raffia to your can starting at the top. 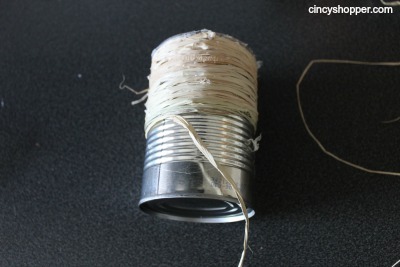 4.Begin wrapping your raffia around your can working down until.I stopped every so often and glued a bit more. 5. After completely covering your can with raffia tie a bow with ribbon and insert foliage. I really was excited that this project came out so cute and only cost me a little over $2 to make. I have a made a few of the raffia vases to place in our bathrooms for those small items that are always looks on the counters. 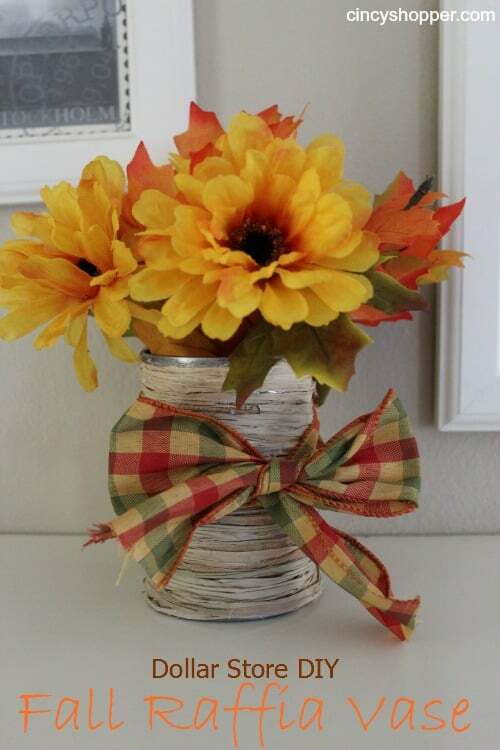 These DIY Dollar Store Fall Raffia Vases can be used for other purposes too. Looking for other Dollar Store Fall DIY Decor Ideas? If so, you can see the others I have created here.